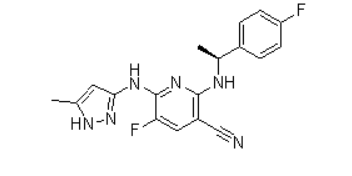 AZ960 is a novel inhibitor of Jak2 kinase. AZ960 inhibits JAK2 kinase with a K(i) of 0.00045 microm in vitro and treatment of TEL-JAK2 driven Ba/F3 cells with AZ960 blocked STAT5 phosphorylation and potently inhibited cell proliferation (GI(50)=0.025 microm). AZ960 demonstrated selectivity for TEL-JAK2-driven STAT5 phosphorylation and cell proliferation when compared with cell lines driven by similar fusions of the other JAK kinase family members.